Eritrea: Eritrea: Will the Dutch close the Eritrean embassy? There is mounting concern in the Netherland about the behaviour of the Eritrean embassy and its staff. Last Friday’s abortive conference, held by the Eritrean regime in the Dutch town of Veldhoven, may prove to be the final straw. The four-day conference was abandoned after a Dutch court backed the mayor of the town in closing the gathering, arguing that it was detrimental to safety and security of local residents. Spokesmen for the majority of Dutch political parties had called for action even before the conference opened. News of the event, to be attended by President Isaias Afwerki’s senior adviser, Yemane Gebreab was broken last Tuesday by the Dutch website, One World. On hearing the news of his imminent arrival Dutch MPs reacted with dismay. The Dutch cabinet also expressed its reservations about the gathering. A statement was issued declaring that the government was “uneasy” about the conference going ahead, but could not prevent Yemane Gebreab from attending since he had an EU-wide Schengen visa. Kubrom Dafla Hosabay, a former deputy minister of finance in Eritrea, now resident in the Netherlands, warned what would take place if the meeting took place. 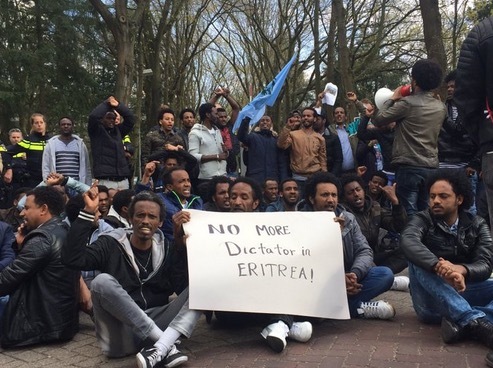 Fearing a repetition, members of the Eritrean community opposed to the regime protested outside the hotel in Veldhoven at which the conference was being held. There followed a confrontation with the police and running clashes, with a number of protesters being arrested. The mayor of Veldhoven – hearing that a further 2,500 protesters would arrive from across Europe to oppose the event, decided that it should be cancelled. The youth wing of the ruling party (the YPFDJ) which had organised the event, challenged the ruling in court, but lost, and on Friday the four-day conference was abandoned. A number of political parties in the Netherlands had previously expressed their concern about the activities of the Eritrean government in their country and its extortion of funds from the refugee community. They had called for action against the Embassy unless it was halted. Last June the question was debated in Parliament. A resolution was adopted suggesting that the Embassy should be closed if it continued to use threats and pressure to extract taxes and financial contributions from the Eritrean diaspora. It soon became clear that the warning had not been heeded. Evidence of what was taking place was gathered by journalists Huub Jaspers and Sanne Terlingen for a radio programme – ‘The long arm of Eritrea’, produced for One World and Argos. The journalists had gathered testimonies and documentation showing how Eritrean Embassy staff went around the Eritrean community in Rotterdam, and several other cities. Since last December they had been going door to door among the diaspora collecting funds. The approach of the Embassy was anything but friendly. They demanded EU50 per person as a donation to fund the conference. Anyone who refused was warned that they would have a cross placed after their names – a clear sign of intimidation by representatives of Eritrea’s brutal regime. Receipts for the funds were signed by Isaac Menassi – the Embassy Finance officer, using a commercial receipt book. But his signature was clear. A handwriting expert testified that having examined the receipts, and comparing them with official Embassy receipts, he was confident that they had been signed by the same person. When the One World journalists broke the story Dutch politicians were furious, declaring that such behaviour was completely unacceptable. The abandoned conference was the 13th in a series of meetings held to bolster support for the Eritrean regime across Europe. Around 500 YPFDJ supporters had come to hear their leader’s message. It had been – the organisers claimed – a year in the planning. But members of the Eritrean opposition were determined that a regime which tolerates no free speech at home should not be given a platform from which to put forward its propaganda. When an Eritrean diplomatic car drew up the protesters staged a sit-down demonstration, preventing its progress. There were clashes with the Dutch police and over 100 protesters were briefly arrested. Opponents of the Eritrean government informed the authorities that up to 2,500 demonstrators would arrive on Saturday, as members of the diaspora mobilised across Europe. In the light of this the mayor ordered the conference to be halted. His decision was upheld by a court, which ordered supporters of the YPFDJ – to leave the hotel by 8.00 pm that evening. This took place, with busses removing them from the venue. The YPFDJ put out a statement attacking those who had prevented the gathering from taking place. From next Thu, 13/4 to Sun 17/.4/17, the Isaias regime has organized a European wide conference for Youth-Pfdj, its daughter organization. The Dutch authorities, including the media, are wary of this conference because it has elements inviting antagonism, that pose danger to peace and order of the Dutch public. This is a call to all Dutch-Eritreans, whether or not, we are citizens, residents, and refugees, to use our rights, to formally register, with the police, a declaration (‘aangifte’) that the Ypfdj, poses danger to our personal safety. Because what should worry us, also worries Dutch authorities, including several parliament members (2de Kamer), and the security. Issues about the Ypfdj may cause harm to Eritreans and the Dutch. 1. That Ypfdj thugs are going door-to-door, forcing Eritreans to pay money for this conference and for 2%. 2. That they are issuing false “receipts” without legal details, means they are hiding their actions from public. 5. That a Dutch court, established last year, that Ypfdj, as a possible ‘intelligence arm” of Isaias; the public speech of Yemane G/Ab, at Ypfdj conference in Germany, being the major evidence of it. 6. That all of this has been organized, in December 2016, by high ranking officials of the regime. Etc., etc., because of all the above, is this Ypfdj conference, is a threat to, us, Dutch-Eritreans. That is why, we should, go and declare this facts to the police. We are being threatened by phone and in person as “traitors”. The reasons are laid down above. Let us exercise this right of ours immediately, but in any case, before the conference commences. Let us support the effort of the Dutch authorities by coming out to register officially our fear of the situation. As the brand-new month starts pokemon followers not just have the upcoming pokemon tcgo codes leakages to appreciate yet additionally pokemon tgc codes online booster pack codes.